Earlier this week I spotted an ad in the newspaper, promoting an Elvis theme aboard the ferry Stena Danica that operates the route between my hometown Gothenburg and Frederikshavn in Denmark. I can actually see the ferry terminal from my apartment, but it was a case of "So close, yet so far" as I wasn't able to make any of the four crossings that offered Elvis entertainment aboard, such as Elvis music, Elvis-quiz and Elvis style food. But reading the ad made me think of the time I held a lecture about Elvis aboard another ferry, about six years ago. This was a couple of months after I produced a one hour radio program called Rock me Lord dedicated to Elvis religious songs that was broadcast on Easter. The guy responsible for the entertainment aboard the ferry Stena Nautica had listened to the program, and gave me a call, asking me if I was interested in holding a lecture about Elvis on one of their crossings between Varberg (a bit south of Gothenburg) and Grenå i Denmark. Of course I was. I decided to cover some episodes in Elvis life, and illustrate them with music as well as video clips. As I embarked aboard the ferry on October 18, 2006, I was a bit nervous. What if nobody showed up? But as it turned out, I needn't have worried. The big room where I was going to give the lecture quickly filled to the last seat, and I soon found myself talking about things like Elvis' recording his first song (and playing "My Happiness"), his early TV appearances (then showing a clip of Elvis singing "Hound Dog" on The Milton Berle Show), his movie career (evoking laughter by playing "Beach Shack" that has Elvis breaking up) and the Comeback in 1968 (illustrated by "Guitar Man" and All Shook Up"). But the highlight for me was near the end, where I showed the audience a clip of "An American Trilogy" after telling them about the Aloha From Hawaii Via Satellite television special. At the song's finale, the whole room erupted with cheers and applause. At that moment, I realized that the lecture had gone really well. Mainly thanks to Elvis, but I was proud in having played a part in it too. "A Flashy, Show-biz Razzle-dazzle Fashion"
Thanks to earlier FTD releases such as Dixieland Rock and Dixieland Delight I've learned what an incredible experience it must have been to see Elvis live on tour in the spring and summer of 1975. Not only was Elvis himself often in good spirits and voice, but the audiences also created atmospheres in the auditoriums that were incredible. No doubt this holds true for the Shreveport evening show as well. More than 11,000 fans attended this concert, as well as the afternoon show a couple of hours earlier. But there was one person in the audience who didn't seem to enjoy himself; Mark Melson who wrote a review for the Shreveport Times. Lee Cotten refers to the review in his book Did Elvis Sing In Your Hometown, Too?, and it's a funny read. Melson wasn't pleased with "How Great Thou Art" - possibly the only person in the auditorium who felt this way. According to Melson, the song "was sung in a flashy, show-biz razzle-dazzle fashion that seemed completely at odds with the message of this popular hymn." Melson did admit, "The audience seemed to enjoy Presley's stage antics as much as his singing." One of Melson's problems was the location of his seat - slightly behind Elvis and two rows from the railing. As he later wrote, "My feet got trampled, my notebook was knocked from my hand, and one little girl even stepped on my right shoulder on her path to the railing." 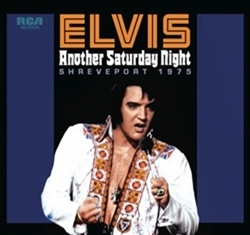 Interestingly enough, Lee Cotten also reports that it was rumored that the Shreveport evening show would be broadcast nationwide to celebrate Elvis' 20th Anniversary with RCA Victor, but that this didn't happen. Now, thanks to FTD, the concert will be available for all who wants to know how it sounded when Elvis performed in Shreveport for the first time since leaving the "Hayride." And unlike Mark Melson, I'm sure I'll enjoy it. By the end of April, FTD will also release the book Welcome Home Elvis 1960 covering the vital weeks in 1960 where Elvis regained control over his career, as well as Promised Land – The Companion Album on vinyl. 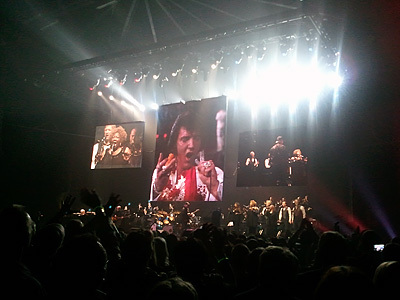 "I've Seen It About Five Times"
Standing ovations at the end of "An American Trilogy" at the Forum Arena in Copenhagen. I had a great time in Copenhagen yesterday, watching Elvis Presley In Concert together with my brother and some 4,500 additional fans at the Forum arena. 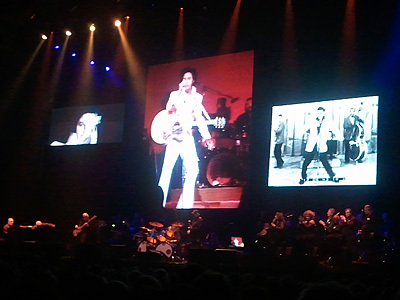 Unlike two years ago, when me and my wife arrived a quarter of an hour late to the Wembley Arena in London to see Elvis perform "live on screen," this time around I catched the show from the start. With the help of Google Earth, the map on the screen zoomed into Copenhagen and the Forum arena. This was followed by footage of Elvis (not the real thing but looking the part) walking along the corridors, handing his glasses to Joe Esposito, and then walking onto the stage, kicking into high gear with "See See Rider" from the Aloha concert. Very effective. Having attended the show in London (well, most of it, anyway), yesterday's concert didn't bring many surprises song wise. In fact, the song lineup between the last tour and this one were almost identical as far as I could make out, with the majority of the footage taken from Aloha From Hawaii Via Satellite and That's The Way It Is. One nice addition I spotted was the inclusion of "Funny How Time Slips Away" from Elvis On Tour, complete with Elvis' dialog "I'd like to turn the houselights up and take a look at you." 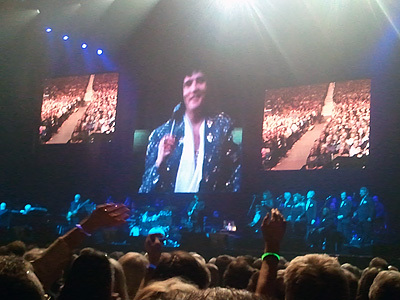 The lights in the Forum arena were then turned on, and the audience shown on the two smaller screens while Elvis smiled on the big screen in the middle. Then it almost felt like the real thing. "Love Me Tender" also offered a strong illusion of a real Elvis concert. First, the audience started to applaud wildly when Elvis started to sing, after which he responded "Thank you." And after finishing the song (and kissing a lot of girls), he said something like, "I'll get to you in the balcony in a minute," at the same time looking in their direction. I couldn't help myself, but glanced at the audience seated higher up in the Forum arena, at the first floor. Another illusionary moment. I also liked the fact that the producer Stig Edgren had incorporated some funny moments with Elvis on stage, like when he plays a toy guitar before singing "Love Me Tender." But sometimes I wondered if the audience laughed because they recognized those scenes, or if they thought it hilarious. Maybe it was a little of both. Elvis Presley In Concert is an impressive production, especially considering the musicians and singers on stage are now in their early seventies. And the audience clearly had a good time, proof being the many standing ovations, on songs such as "How Great Thou Art," "Suspicious Minds" and "An American Trilogy." Counting yesterday's show, I have now seen Elvis Presley in Concert (or Elvis–In Concert as it was known at the beginning) five times. Nothing can beat the first in 1999, but I've enjoyed them all (my only bit of criticism being that the song lineup differs so little from tour to tour). Two years ago in London, I thought I'd seen the show for the last time as I walked out of the arena. Yesterday I was thinking the same thing. After all, the production has been around since 1997, and the musicians aren't getting any younger. But who knows, I might be proven wrong again. In fact, I wouldn't mind that a bit. How about an Aloha From Hawaii Via Satellite 40 year anniversary concert next year? Currently on parental leave with my one and a half year old daughter I don't have as much time for Elvis as I used to before I became a father. So I have to choose carefully what I want to do Elvis wise with what spare moments I have, usually when she's tucked in for the night. The last two months I have given priority to writing an article about the Follow That Dream (FTD) collector's label for Elvis International magazine. It all started with an e-mail right before Christmas from Phil Arnold, who runs the ElvisBlog and is a regular contributor to the magazine. He'd noted that I'd posted over 100 articles dealing with FTD, and asked me if I was interested in writing something about the label for the magazine, in the way of a general overview. I thought about it during the Holidays and decided that it was an offer I couldn't refuse, as Elvis International magazine seems like an excellent publication. So I came up with the idea of focusing on the CD's in the series, how they have developed during the 13 years the label has existed, and how listening to studio outtakes and live concerts can help you get a feel for how Elvis approached his work. Phil Arnold and the editor, Darwin Lamm, liked my idea, so I went ahead with it, illustrating my story with some examples, taken from FTD classic albums as well as soundboard recordings. I ended the article with a look at the "what if" albums FTD has put together, like Standing Room Only and Elvis Sings Guitar Man. Earlier this week I sent the article to the graphic artist who puts the magazine together, after learning that it will come out prior to August 16, so it can be sold at Graceland during Elvis Week. It's a good feeling knowing that what I wrote will be read by fans such as myself in Memphis. And maybe Ernst Jorgensen himself will notice it, too! Today I listened to all five takes of "It's Still Here" on the FTD treatment of the Elvis (Fool) album. I did this after reading an article about Elvis' interpretation of Joe Hunter's ballad in a book by Swedish music journalist and music critic Lennart Persson (1951-2009), titled Feber 2–Sånger om kärlek (translated as Fever 2–Songs about love). It was published in 2004. In the book, Lennart Persson tells the story of 63 of his favorite love songs that he feels deserve to be highlighted, either because they have been forgotten, belittled or simply because they are damn good. Some of the artists he writes about are Jerry Lee Lewis, Gram Parsons & Emmylou Harris, Dusty Springfield, Tom Waits and Elvis Presley. Among other things, he has this to say about Elvis' recording of "It's Still Here:"
He seems unaware that the tape recorder is rolling. He does it again [as he did while recording "I'll Take You Home Again, Katleen"] as if it was only for himself, as if to conjure up his deeply buried emotions. His marriage to Priscilla was in tatters, they were basically already separated, and only six months later she would leave Graceland. Elvis greedily absorbs every self-pitying word from Hunter's slender ballad, as if to prepare himself for the final separation. He handles the grief in what is probably the only way he is capable of, through the music. According to Lennart Persson, "It's Still Here" might very well be one of Elvis most "naked" recordings ever. I share his sentiment, it's an intimate and sensitive performance, conveying feelings of sorrow, loneliness and longing. Highly emotional, and highly recommended. 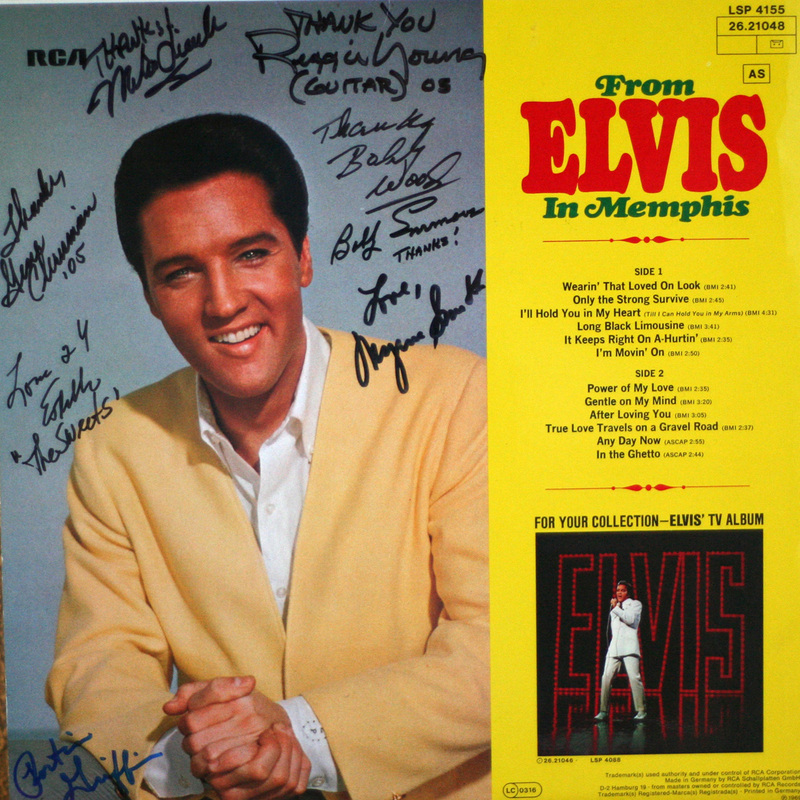 The records in my collection that I value the most are the ones signed by musicians I've met who played with Elvis. Listening to them talking about their time with Elvis in the studio, and then getting an autograph on a record they played on makes for a great memory. Choosing the record in question is half the fun. 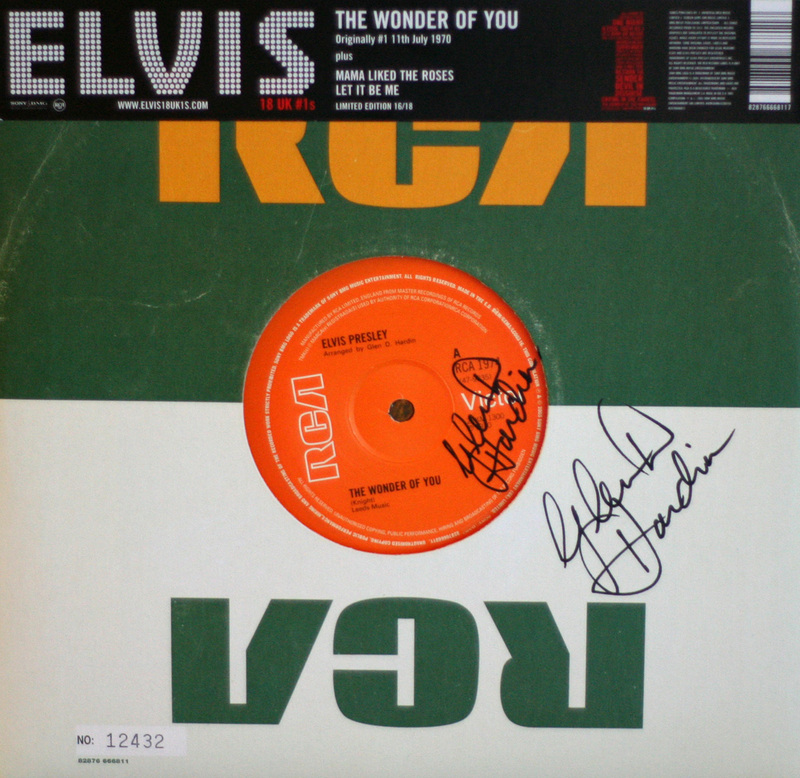 When I went to see Glen D. Hardin when he played in the Swedish town of Uddevalla at an Elvis Christmas concert in 2006, I brought with me the single "The Wonder Of You." "Arranged by Glen D. Hardin," it says on the orange label, so I couldn't think of a better place than that for his autograph. A year earlier the American Sound Studio Band also performed in Uddevalla, together with the Sweet Inspirations. The choice of record was a simple one. 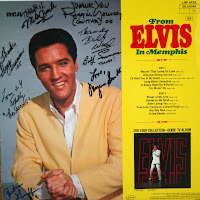 All the band members signed my copy of the From Elvis In Memphis LP after the show. It was a very special moment. 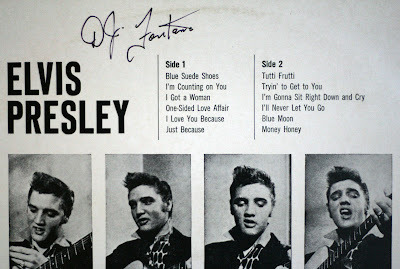 Now, if all goes according to plan I will soon have another Elvis record signed by one of his old band members. As I've written in earlier postings, I will attend The Original Elvis Tribute 2012 opening show at Vara Konserthus (Vara Concert Hall) on April 7. 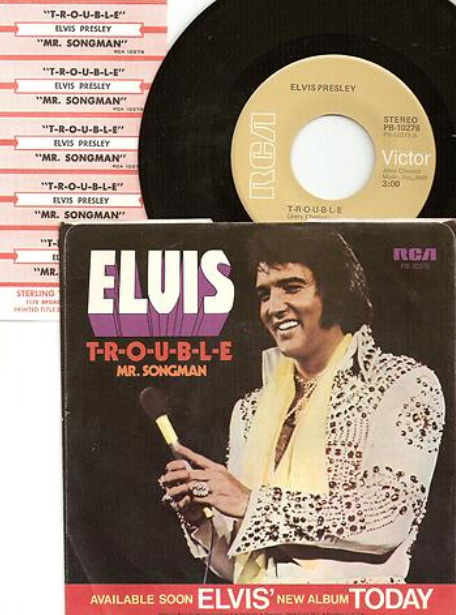 The production features five of Elvis' original musicians. One of them is Duke Bardwell, who played bass on a song which has been a favorite of mine since I first heard it on the Elvis Today album, the frantic rocker "T-R-O-U-B-L-E." So yesterday I bid on, and won, a copy of the single on eBay, including some jukebox title strips, which I thought was pretty cool. 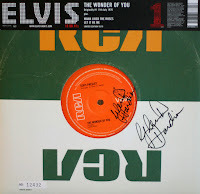 So, the perfect record for Duke Bardwell to sign, even more so as it's his only surviving record master with Elvis (Producer Felton Jarvis erased all of the other bass parts Duke Bardwell recorded at the Elvis Today sessions). But which records should I bring for Bobby Wood, Mary and Ginger Holladay, and Jerome "Stump" Monroe to sign? Suggestions, anyone? Writing about Elvis '56 in my latest post made me remember the first time I watched this documentary TV special - in the bowels of a warship. In the autumn of 1987 I had just started my military service in the Royal Swedish Navy. After a couple of weeks of basic training I reported aboard the flagship and minelayer HMS Visborg, where I trained to become a signalman. 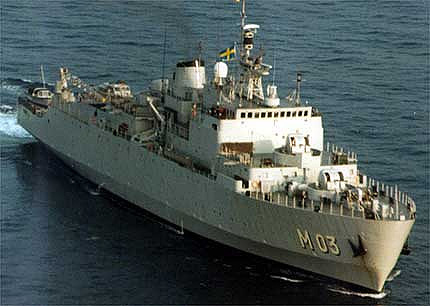 Later on I served on a fast attack missile craft in that capacity, but that's another story. This one takes place on HMS Visborg. One morning I read in the newspaper that an Elvis documentary was to be shown on television, called Elvis '56. I don't remember how I had the time to look through a paper, as life in the military was a pretty hectic affair, but apparently I did. I was also lucky in the sense that I had no duties that night, so I decided there and then that this wasn't a documentary I was going to miss out on. My only worry was that my fellow off-duty shipmates probably weren't as interested as me in watching Elvis on the one TV set that we had access to in our recreation room. In those days Sweden only had two channels, but whatever was on the second one, I was sure they would go for that instead. Then it hit me. A lot of our theoretical lessons had taken place in a briefing room deep down in the ship. And I clearly remembered a television set bolted to the wall ... excuse me, bulkhead. So what I did that night, when it was nearly time for Elvis '56, was to descend a lot of staircases and open a lot of hatchess to reach that briefing room, hoping to find it empty. To my relief it wasn't in use, and after some experimenting with the TV I got it working. I dimed the lights, sat in one of the chairs, and turned my attention to the screen. I then spent the next hour watching what was one of the best documentarys about Elvis I had seen so far. When I returned to my buddies a couple of decks above, I was probably the happiest sailor aboard the ship. The whole family coming down with the flu hasn't left much time for Elvis. 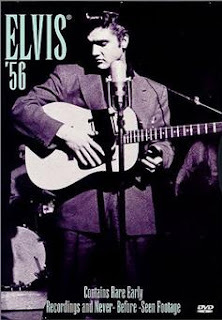 I have, however, managed to spend an hour alone on the couch, recuperating with my DVD copy of Elvis '56. As it was ages since I watched this documentary TV special (it originally aired in 1987), I didn't quite know what to expect. But I was pleasantly surprised by how well it had withstood the ravages of time. By mixing still shots (many of them by Alfred Wertheimer) with filmed footage it effectively tells the story of Elvis' breakthrough year, 1956. Some of the vintage clips I remembered, like the one in color from Elvis on stage during his SUN days. Really incredible stuff! There are also some great footage of Elvis in Las Vegas, both while performing and visiting Liberace's show, as well as film of him on stage in his gold lame suit. But in the end it's the TV appearances that make Elvis '56 so exciting. After all, this is what it looked like when Elvis entered the living rooms of millions of Americans, many of whom didn't know what to make of him at first. Watching Elvis sing his raw and bluesy version of “Hound Dog” on The Milton Berle Show is maybe the most telling example, as this performance caused an outraged reaction in newspapers across the country. What an humiliating experience it must have been to sing the same song dressed in a tuxedo to a real dog on The Steve Allen Show about a month later. Even though it's 25 years since its original release, Elvis '56 still feels surprisingly fresh. In my opinion it manages to tell the story of the 21 year old singer's rise to national and international stardom in a credible way. And to think that it all happened during just one year! A final note: in the book Elvis: His Life From A to Z there's the following passage about Elvis '56: “Particularly interesting were the recording-session tapes of “Hound Dog” and “Don't Be Cruel.” If my ears don't betray me it sounds like authors Fred L. Worth and Steve D. Tamerius were fooled by directors Alan and Susan Raymond using studio banter from a completely different session, one done many years later for the movie G.I. Blues. 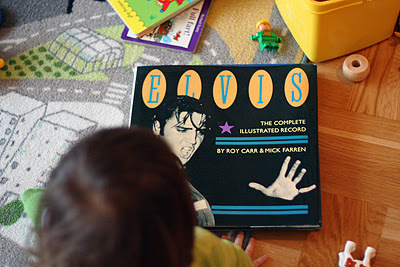 Elvis: The Complete Illustrated Children's Book? Not many things at home are off limits for our nearly one and a half year old daughter. Except my Elvis records and books. ”Those are daddy's,” I say and try to look her sternly in the eyes when she approaches my collection. Which in a way is a stupid thing to do, as I want her to get to know her father's great idol. But she recognizes other things in the book as well. On one page there's a shot of Elvis sitting on his bike in the movie Clambake. Spotting this, she always imitates the sound of a motorcycle. And when we come to the still from Paradise, Hawaiian Style of Elvis and all those dogs aboard a helicopter, she mimics a dog barking. She also says the Swedish word for ”Santa” when I point at the cover of the ”Merry Christmas Baby” single, and ”at” (meaning ”hatt” which is Swedish for ”hat”) when we come to a full page photo of Elvis wearing a Texas Stetson hat at the February 1970 Houston press conference. And of course there's a lot of ”Is” as we look at all the photos of Elvis. The authors and rock writers Roy Carr and Mick Farren published The Complete Illustrated Record in 1982 as ”the definite critical guide to the complete career of Elvis Presley,” documenting and examining his every record and movie. I wonder what they would think of it being used as a children's book 30 years later?